I'm bringing the culture and history of Winston-Salem beer to you in the form of original recipes using NC Beer Month as an inspiration while promoting a fantastic NC Beer Month Getaway package! Scroll down a little bit and get the details on how to enter the contest! I've partnered with NC Beer Month, Lowes Foods and Visit Winston-Salem for the 2nd year in a row, to bring you a series of content AND events throughout the month of April to educate, promote and entice you about the craft beer scene in Winston-Salem, North Carolina. Together, we're a perfect beer pairing: I'm a pepper jelly flavored Jelly Bean (new, fresh, a little eccentric while trendy) while Lowes Foods and Visit Winston-Salem are the tried and true American Pale Ale that's reliable and a perfect accompaniment. 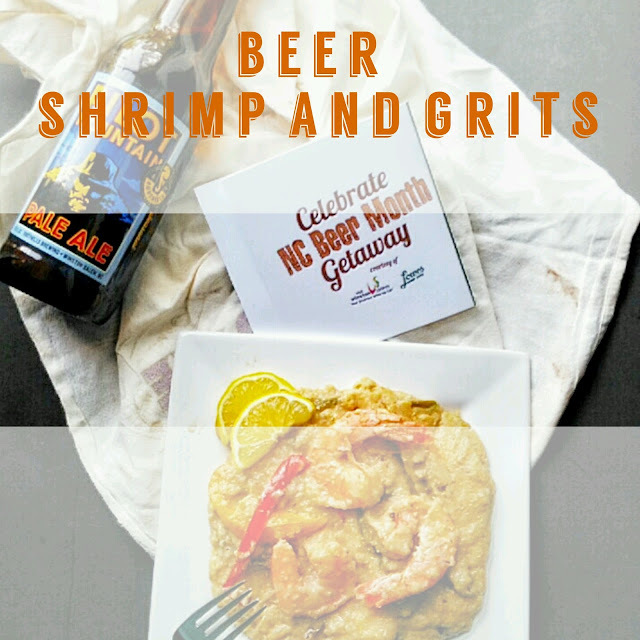 Today I'm sharing an exclusive Beer Shrimp And Grits recipe! Either you love them or you hate them. There is no inbetween. I tell people who say they "hate grits" that they've never had them prepared properly. Raise your hand if you think of that scene in "My Cousin Vinny" where Joe Pesci asks, "What is a grit?" every time you hear about grits. The South is called the "Grits Belt" in some culinary circles. Originally, shrimp and grits was a breakfast dish eaten in coastal communities. It wasn't until 1985 when Bill Neal of Crook's Corner in Chapel Hill, North Carolina put shrimp and grits, as we know it, on the map. Essentially grits, cheese, bacon, mushrooms and scallions made a sensation in the New York Times and Food And Wine magazine. As many people there are in the world, there are variations of shrimp and grits. Every Southern restaurant has it on their menu and home cooks try to attempt it. It seems that all roads lead to Winston-Salem as the Triad is the anchor that holds the Coastal Plains and the Blue Ridge Mountains together. The City of Arts and Innovation is not only the birthplace of the state's craft beer movement, but the Twin City is also in the center of culinary conversations and quite the compass rose of a culinary destination. 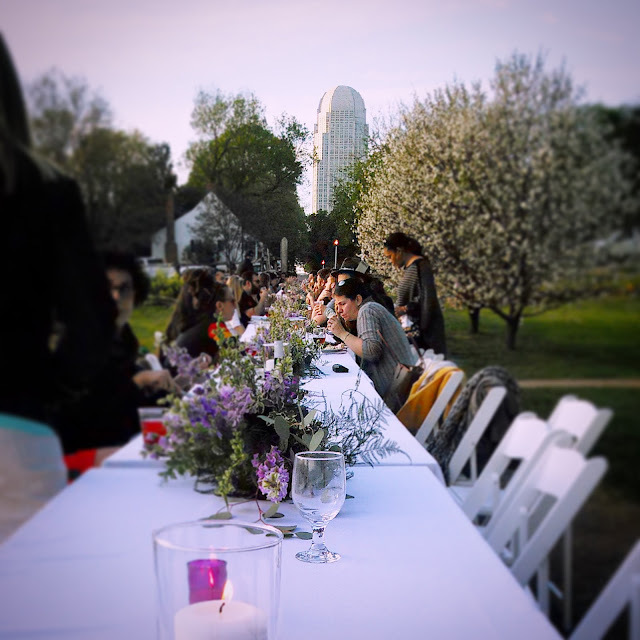 The Moravian Cookie Trail, Moravian Chicken Pie Trail, Moravian Sugar Cake Trail, NC Cheese Trail, and NC Wine Trails all snake their way to and through Winston-Salem. Award-winning chefs, restaurants and annual culinary festivals are just the tip of the iceberg lettuce wedge salad of my favorite city in the world as a destination. 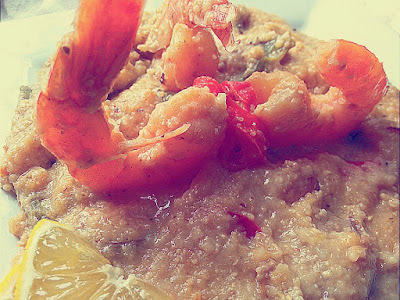 Want an opportunity to sample the following Shrimp and Grits recipe for free? Scroll down to see which Lowes Foods locations I'll be sharing craft beer recipes, opportunity to enter the Beer Getaway and hear about the Winston-Salem beer story. I've updated the classic recipe to include beer, beer and more beer. Specifically, I've used Foothills Brewing Pilot Mountain Pale Ale. This seasonal favorite is named for a popular area landmark, Pilot Mountain (very close to Andy Griffith's real-life Mayberry) and is a classic American style pale ale. The keys to creamy, smooth grits is fresh, stone-ground grits, time, a 1:1 ratio of stock or water and milk or cream and cheese. Insert beer instead of water and deglaze your pan with beer instead of water and not only are you adding more flavor, you're being creative. Make sure you serve with a lemon wedge to accompany the fresh shrimp and to cut the hoppy undertones of the dish. Come visit me and taste these exclusive recipes! I know I'll see you at each live event! 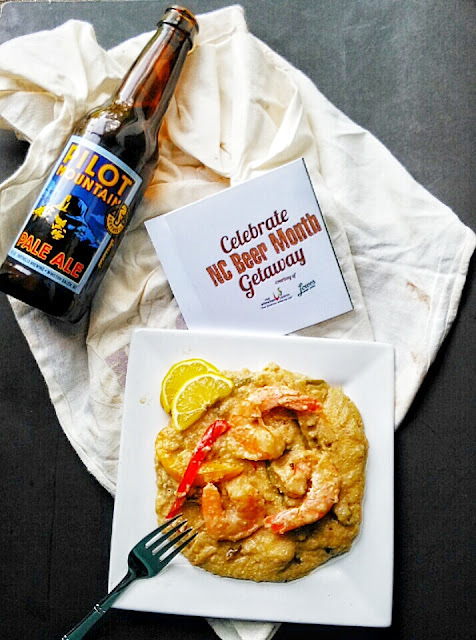 Don't forget to enter to win the Beer Getaway package and stay tuned for more details about each recipe and more fun facts about NC Beer Month! Add flavor with beer to this traditional recipe. Pairs well with a light lager or American Pale Ale. 1. Bring first 4 ingredients to a boil in a medium saucepan; gradually whisk in grits. Reduce heat, and simmer, stirring occasionally, 10 minutes or until thickened. Add Cheddar cheese and next 4 ingredients. Keep warm. 2. Cook ham in a large skillet until crisp; remove from pan and set aside on paper towels. 3. Sprinkle shrimp with pepper and salt. Set aside. 4. Sauté mushrooms in hot skillet 5 minutes or until tender. Add green onions, and sauté 2 minutes. Add seasoned shrimp and garlic to the pan and sauté 2 minutes or until shrimp are lightly browned. 5. Stir in pale ale or lager, lemon juice, hot sauce, and cook 2 more minutes, stirring to deglaze the pan. 6. Serve shrimp mixture over hot cheese grits. Top with reserved diced ham.